While Blackhand Gorge resulted from the erosion of Black Hand Sandstone, the gorge was not named for the sandstone. According to legend, an American Indian petroglyph, which was in the shape of a hand and colored black, once existed on the gorge's northern wall. Several theories exist for why Ohio's American Indians carved the hand into the cliff. The most accepted explanation is that the hand was a message to various tribes that passed through the gorge that they must travel in peace. Unfortunately, construction of the Ohio and Erie Canal resulted in the petroglyph's destruction in 1828. 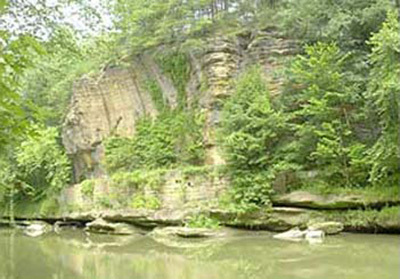 The Central Ohio Railroad also ran through the gorge along the Licking River's edge. The first train passed through the gorge in 1851. In 1903, an interurban line also opened through the gorge, connecting Granville, Ohio, Newark, Ohio, and Zanesville, Ohio. The last interurban car traveled through Blackhand Gorge in 1929.